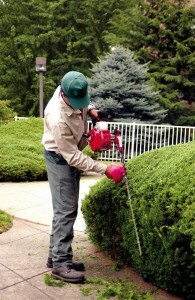 Since 1955, the Little Wonder gasoline-powered hedge trimmers have encapsulated “American-Made” quality craftsmanship. From the high-carbon steel blades, to the handle design, Little Wonder gas hedge trimmers have stood the test of time and daily use of rental customers and professional landscapers worldwide. High-carbon steel blades maintain a sharp cutting edge six to ten times longer than traditional steel blades. Dual-reciprocating blades are engineered to glide smooth for flawless, vibration–free trimming and superior cutting performance in any direction. Shock mounts in the handle assembly enhance user comfort. And a powerful commercial-grade 21.2cc engine with electronic ignition and a primer bulb carburetor ensures quick starts. Transmission features hardened steel gears to produce higher torque than competitive models to maintain top blade cutting speed through thick, heavy growth.